Stephanie Chen is compiling three signature desserts for "Finals Week" and one of them is a tricky confection that is dedicated to her sister's nostalgic palette. Stephanie describes the recipe for her "Salted Caramel Pot De Crème" topped with Rose Wine Marshmallows as "very ambitious" because of its "temperamental" tendencies. The custard has to have the right consistency or else it ends up being a "runny mess." 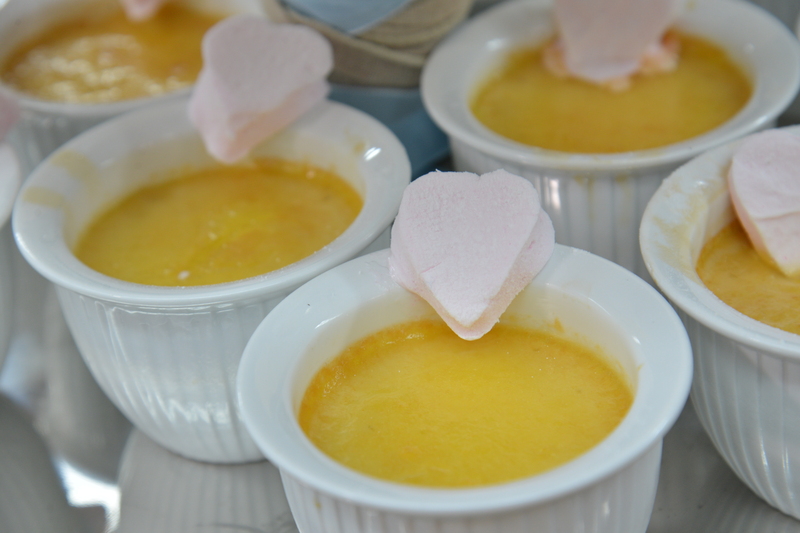 One of the tricks is to cook the custard cups in a water rack to help avoid the risk of overcooking. See how she gets it done by tuning into the full episode "Finals Week" from The Great American Baking Show Season 2 Episode 8. 1. In a small bowl, add powdered sugar and cornstarch. Spray a quarter sheet jelly roll pan then dust with powdered sugar / cornstarch mixture. Pour out any excess back into a bowl. 2. In a stand mixer bowl with the whisk attachment, add ½ cup rose wine. Sprinkle gelatin over the liquid and mix together until dissolved. Spray a rubber spatula and have it ready for mixing later. 3. In a medium heavy saucepan, combine sugar, corn syrup, salt and 1/4 cup of water. Begin to heat and stir until sugar is dissolved. Heat mixture on medium high heat till it reaches 240 F.
4. Turn the mixture on low and in a slow stream add the sugar mixture into the side of the bowl. Once the mixture is all in, increase speed to high and mix for 10-13 minutes until lukewarm and fluffy. Make sure to keep mixing full amount of time till mixture looks like soft serve ice cream. 5. After 9 minutes of mixing, add in a little drop of pink food coloring. 6. Immediately scrape the mixture into the pan and spread it out with a spatula. Let the marshmallows sit for a few hours to "cure". 2. Whisk egg yolks in a medium bowl and set aside. 3. In a medium heavy saucepan, combine sugar and ½ cup of water. Begin to heat and stir until sugar is dissolved. Turn up heat and boil mixture. Do not stir once boiling. 4. Continue to boil on medium high heat for 5-10 minutes to brown the sugar syrup. Brush down sides with water as needed. The browner the syrup the more caramel flavor. 5. Lower heat to medium. Next, stir in the cream little by little. Careful as it will splash. Stir until all the cream has been dissolved. 6. Carefully drizzle HOT cream into the egg yolks and whisk together. Stir in vanilla extract. 7. Pour mixtures into oven safe small 2 ounce ramekins and set into a baking dish. Pour hot water into the dish to come up about an inch or two. 8. Bake for 30-40 minutes until custard edges are set but still a little wobbly. 9. Remove from water and cool completely. Refrigerate to chill for at least 3-4 hours. When tops have set, sprinkle with sea salt.